Why Sharp Digital Lab Vs the huge mega-lab? Unlike the mega labs, we treat businesses as people rather than an account number. Do you Die-Cut wallets ? Yes. We Die-Cut 8 up wallets. Unlike other labs this service is FREE at Sharp Digital Lab. Do you off volume discounts? Yes we offer volume discounts. Discounts start at 15 units call for special pricing. We also match any photo labs published prices for the same product. How do I get my files to you? Files can be brought into the lab. We accept emailed files at tech@sharpdigitallab.com or mailed in. Most of our customers use our web upload. To use this you must apply for a web upload we will respond within 24 hours with your user name and password. Then follow the on line instructions. What file types do you accept? 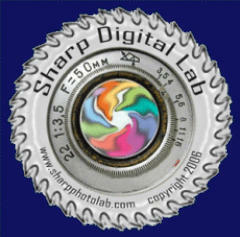 Sharp Digital Lab accepts jpeg or tiff files. JPEGs must be 8bit RGB and saved as baseline (Standard) format. Tiff files must be 8 bit, RGB , flattened, without alpha channels, and saved without compression or image pyramid. For best color results, all files should have an embedded profile in the sRGB IEC611966-2.1 color space. Other file types may be uploaded, but we recommend jpeg. How do I name my files? When naming a file, be sure not to use spaces or special characters (&,#.etc.) Special characters may render an order unprintable. Name your files: (Example) F21_2 5x7_ 4 3x5_ 1 8x10 What Photoshop Color Settings Should I Use? • Open Photoshop. In the menu bar go to Edit> Color Settings • Go to Working Spaces and for RGB Files select sRGB IE611966-2.1 • Under Color Management Policies next to RGB select “ Convert to Working RGB • Next to Profile Mismatches check “ask when opening” and “Ask when pasting” Whenever you open a file that is in a color space other than your working space, Photoshop will prompt you to convert the working color space. If you would rather not be prompted when opening a file with a different embedded profile than your working space , you can uncheck the “ Ask when opening” box and the “Ask when pasting” boxes next to the profile mismatches. Photoshop will then apply your work space to files that are in a different color space or with a missing profile. VERY IMPORTANT: When you save your files, make sure to check the “embed color profile” check box in the save dialog box or your working profile will not be embedded and we will not know the color space of your files leading to inaccurate color.